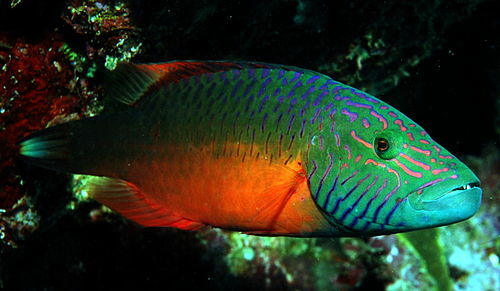 A wrasse from the Red Sea that shows up for sale from time to time in LFS. Comes in a number of different colors and markings and can be confused with other wrasse, usually the Ring Tail or the Napoleon Wrasse. Adult coloration is an iridescent purple with purple stripes on and around the head; this fish just glows under good lights. Can be some what aggressive and gets to about 1 foot in size. Should be kept in FO or FOWLR tanks.